Washington Challengers Cup was held December 29-30 at the Tacoma Chess Club. Harley Greninger, playoff tie-break winner of the open section, is seeded into the 2008 state championship in February! Congratulations to Alex Guo, winner of the WA Junior Closed with a perfect score of 4.0! Alex is also seeded into the state championship. Portland Winter Open was held Dec 15-16. Strong showing by Washington students at Nationals! – USCF held its 2007 K12/Collegiate Chess Championship in Houston, Texas, December 7-9 with over 1,300 players from 39 states represented. Washington players performed well in the main event, with individual trophies: 15th place (2nd grade) for Noah Fields, 12th place (6th grade) for Bryan Yue, 10th place (1st grade) for Toshihiro Nagase, 5th place (6th grade) for Nathan Lee, and 2nd place (2nd grade) for Nathaniel Yee. Congratulations! WA-BC Match (Dec 2) – Info from BCCF Bulletin – Played at UBC during inclement weather, this fifth match of the modern era saw the meeting of two teams which on paper were almost exactly evenly matched. However, the Washington players went home with a slim 6-4 victory, largely due to consecutive wins on the middle three boards. One bright spot in B.C. 's favor was Bindi's game, the first time B.C. has taken the full point on board one in the series. This leaves the overall series tied at two wins a piece with a draw in 2006. See http://www3.telus.net/public/swright2/bcwanew.html. Washington Class Championships were held at the North Seattle Community College Thanksgiving weekend (Nov 23-25). USCF crosstable link. Tacoma Open (Nov 17-18). Congratulations to co-winners Michael MacGregor and Nhon Do, who drew in round 5 to share the 1st place and group 1 prizes! Seattle Chess Club Extravaganza (7 Rd G/90, Nov 9-11). Portland CC October G/60 ended in a two-way tie between Nick Raptis and Radu Roua. Each scored 3.5 out of 4 points, with Raptis drawing Roua in round 3. Roua claimed first for himself in the November G/60, scoring a perfect 4 out of 4! Bishops Boooonanza! (Oct 28) 45 students and adults participated in this annual fun event in Clatskanie, OR. 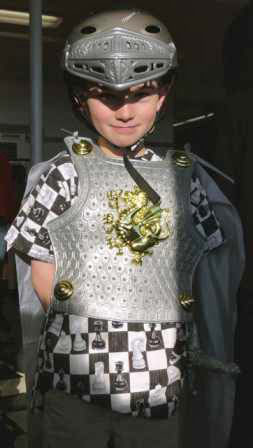 The costumed players enjoyed lucky chess with prizes in the morning and giant chess between rounds. 25 won free T-shirts and many went home with cash and prizes. The day ended with rowdy rounds of Bughouse. And, as always, there were great games of chess! Alex Petersen from Gresham won the sportsmanship award. For full results, visit the Clatskanie Chess Club Website http://clatskaniechessclub.tripod.com. Photos (click to enlarge): Left – Allison Mitchell from the International School of Beaverton - 1st place finisher in the class F, a.k.a. Freaky Frights Section. Right – Sir Lance (alot) Roy, winner of best student costume! North American Chess Association 6th North American FIDE Invitational was held Oct 28 to Nov 3 in Chicago. 10 players from around North America come together in search of gaining their International Master titles bestowed by FIDE. Games were live online on the World Databank of Chess. 13 year old FM Ray Robson scored his first IM norm! Puget Sound Open (Oct 27-28) at the Tacoma Chess Club! Ben Delson Thematic (October 20-21) at the Seattle Chess Club. Players had the opportunity to play some of Ben's favorite openings! Individual Online College Chess League Tournament started October 14. Portland Chess Club Fall Open. Congratulations to winners Nick Raptis (Open) and Robert Holler and Ilia Botvinnik (tied with 4.0/5.0 in the Reserve section). The 25th Annual Western States Open was held at the Sands Regency Hotel/Casino, Reno, Nevada October 12-14. Washington Senior Open (over age 50) was held in Tacoma October 6-7. Congratulations to Washington senior champion Paul Bartron! Portland CC September G/60 ended in a three-way tie between Nick Raptis, Radu Roua and Carl Haessler. Each scored 3.5 out of 4 points, with Raptis drawing Roua in round 4. Sep 29-30 Eastern Washington Open, Spokane, WA. Sep 21-23 Seattle Fall Open. Congratulations to winners Dereque Kelley and Arie Milner (Open, 4 out of 5 score) and Jesse Breneman (Reserve, perfect 5 out of 5). Sep 1-3 Oregon Open, Lane Community College, Eugene, Oregon. Thanks to Jerry Ramey for helping to organize this event. Aug 10-12 (or 11-12) Seattle Seafair Open! See an interesting report on the British Columbia junior chess website. Jul 14-15 Evergreen Empire Open ($600 prizes guaranteed) near Tacoma, and Clark Harmon Memorial Tournament ($1,500 prizes guaranteed) in Portland. Congratulations to Harmon co-winners Emil Anka, Nat Koons and Michael Lee (all with 4.5 out of 5 points). Seattle Chess Club Emerald City Open (June 22-24) – 44 players in 2 sections! 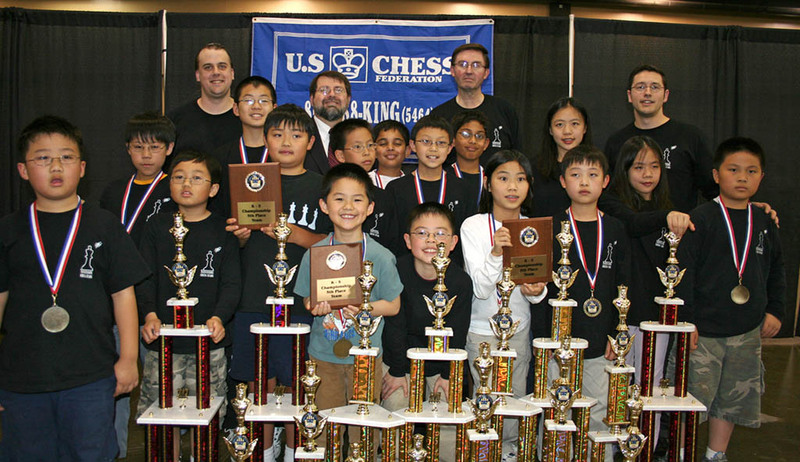 Stevenson Chess Club highly successful at the National Elementary Chess Tournament in Nashville, TN in May 2007. They brought home a 1st Place team trophy in K-3 U800, another 1st Place team trophy in K-5 U900, and a 5th Place team trophy in K-5 Championship, along with many individual trophies competing against over 2,100 players from 45 states. Photo: Stevenson players/coaches. Corrected Results! WA Open and Scholastic Tournaments were held May 26-28 at the North Seattle Community College. The top prize winners in each section were: GM Gregory Serper and Curt Collyer (Open, 5.0/6.0); Geoff Gale and Alec Ho (Premier, 5.0/6.0); Colin Southcote-Want, Alex Chow, Anthony Lamb, Kamran Hughes, Scott Charleston (Reserve, 4.5/6.0); Sompoth Supathanasinkasaem (Booster, 6.0/6.0). In addition, Nhon Do scored 5.5 points in the Reserve section, but was not eligible for a prize due to lack of an established USCF rating. Congratulations to all the winners, and thanks to all the players!! Keres Memorial cross tables are available at http://www.keresmemorial.com/players.html. IM Georgi Orlov was once again the winner of this event! Oregon Class! The Oregon Class Championships concluded the weekend of May 12-13 at the Portland Chess Club for Class C/D/E players. The Pierce County Open was held May 5-6 at the Tacoma Chess Club. See Tacoma Chess Times on the club page for news about other recent TCC events. OR State Champion! – Oregon Invitational Championship – See report on the Portland CC web site. Congratulations to winner Radu Roua, the "Relentless Romanian." Taylor Bailey is the 2007 Oregon State Girl's Champion and Susan Polgar Representative. She won 4 out of 4 games at the 2007 Oregon State Girls Championships held on April 28, 2007. State Elementary Chess Championship, Vancouver, WA, April 21, 2007 – See crosstables on WHSCA website. Elliott Neff reports that "Vancouver, WA was host to the largest elementary chess championship in state history, with 1,248 students from 223 schools competing." Congratulations to everyone involved! Also, see the small photo gallery at http://picasaweb.google.com/kaechster/ElementaryState2007. Washington players among winners of Grand Pacific Open (Apr 7-9 in Victoria, BC, Canada). The winners in the open section were: 1st H.G. Pitre (WA) 4.5/5; Tie 2nd-3rd Mike MacGregor (WA), Brian Esler, Mike Murray (WA) 4/5. Junior players also performed very well, finishing in ties for the top spots in the U2000, U1600 and U1200 sections! Northwest Kids Win Big at Nationals (K-9 Junior High Chess Championship in Sacramento, CA)! More details will be posted when and if available. See Teenager makes all the right moves –Gresham High freshman wins three titles playing chess, including a national championship (by Rob Cullivan, The Gresham Outlook, Apr 7, 2007). Tournament of Champions or Tournament of Challengers – These events were held on April 7. Juniors qualified by scoring 4 points or better (out of 5) in local scholastic tournaments. See http://www.chessplayer.com/stars.htm. Seattle Spring Open – There was a great turnout of 52 players for this event! Sarah May won the WA Susan Polgar Qualifier (March 3-4) with a score of 3.5 out of 4. She follows in the footsteps of her brother Andy May who won the High School state championship for the Denker qualifier – brother and sister will represent Washington state in both national tournaments! Congratulations Sarah! Report on 2007 Oregon High School Chess Team Championship, Feb. 23-24. WA State Champion! Washington State Chess Championship and Premier concluded Feb 19 at the Seattle Chess Club in Shoreline. Congratulations to Ignacio Peres, our new Washington State chess champion! Ignacio scored 7 out of 9 points in the tourney! Josh Sinanan won the Premier tournament with a score of 6 out of 9 points. Spokane Winter Championship started February 1; Pierce County Chess League started at the Tacoma Chess Club on February 2. See TA page for details. Tacoma CC Stephen Christopher Memorial (Jan 27-28) – Mike MacGregor wins! Congratulations to Robert Holler, winner of the Portland Chess Club January G/60, with a score of 3.5 out of 4. Washington Junior Open and Reserve (Jan 15) in Bellevue. Kerry Xing won the open section and qualifies for the WA Junior Closed and the WA Premiere. Justin Yu won the K-3 section, and Alex Zhu won the 4-6 section, all with perfect scores and clear first places! Seattle City Championship (Jan 12-14) at the Seattle Chess Club. Gresham Open (Jan 6-7) – Congratulations to winner Andy May with 4.5 out of 5 points. The new Tacoma Chess Club Tornado was also held on January 6.